We love talking to our users and are never short of ways to say ‘Thank you’ to you. Once a year we get to welcome one of you to our home city Oslo! 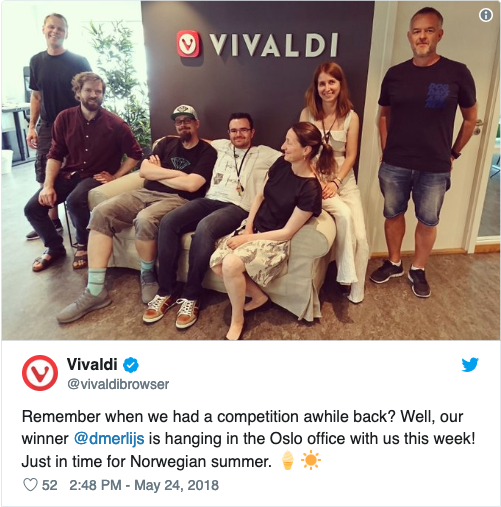 One year ago we ran our first competition to meet the Vivaldi team. After a fierce contest, we welcomed to Oslo Daivy Merlijs from Belgium. Back in December, we asked you to tell us in just a few words what Vivaldi feature or option makes a difference to you and why. A massive ‘Thank you’ to everyone who took the time over the holidays to enter in the contest. Your kind words, great knowledge of the browser and enthusiasm for Vivaldi made an incredible impact and gave us a great boost! Out of the 200 or so entries on the forum and social media, we shortlisted 20. That was a tough, next to impossible job since all the entries were stellar. Out of the 20 entries, we drew one lucky winner. A big congrats to @stanislawmorawski who was the lucky user drawn out of a hat and is the winner of our competition! We look forward to welcoming him to Oslo in 2019! Congrats, Stanislaw! Shortlisting the 20 best entries wasn’t easy. We hope you enjoy reading the entries we selected. In fact, we’re certain you’ll learn something new from at least some of them. Once again, too tough to call but here are the entries we shortlisted. First of all, sorry for my poor English, I’m writing from Argentina. I share most of the opinions you wrote about on previous comments, but there’s definitely one feature of Vivaldi that stand out from the rest for me, and it’s the chance to schedule different themes according to time. So I set it to change to a custom red that “hurts your eyes” at 6 pm, so it works as an alert telling me it’s time to stop working and start spending more time with family. Guys, give that method a chance, believe me, it works! Just stick to that rule for the first week, and after that, you’ll start noticing how this balance starts bringing benefits in every aspect. Thank you, and I’m still waiting for m3. The best thing about Vivaldi is the Web Panels. As a marketer in a company on a very tight budget, I don’t have access to fancy social media managing software. The Web Panels in Vivaldi give me access to some (to me) very important Instagram features that aren’t available in the regular web version of the platform. This way, using Vivaldi browser, I don’t have to take out my phone every time I (for example) need to upload a photo to Instagram. Besides that, the Web Panels are also a great way of storing regularly used websites while keeping my tabs nicely organized. No more searching for that one google maps tab. Just opening a Web Panel and I’m good to go. Hi there! I’m Nick and I hail from the deserts of California. I have been using Vivaldi for over a year now. I truly enjoy this browser and the features that are up and coming. Everyone at Vivaldi has done a great job so far. When I am at work I often have to use a lot of tabs, and being able to stack them is a quick way to stay organized and sharp. However, my favorite feature of all is the CSS modifications via Page Actions. I use Filter Obscure when I am at work often. This usually is my email. In my opinion, Vivaldi’s best feature is Filter Obscure 😊. When I am pulled away by a team member and forget to lock my screen, I don’t have to worry because Vivaldi blurred my private emails, and more. If people are walking behind me, I don’t have to worry as I can easily move my mouse off. Thank you for this amazing feature and the opportunity to have a trip to your offices to meet this amazing team! 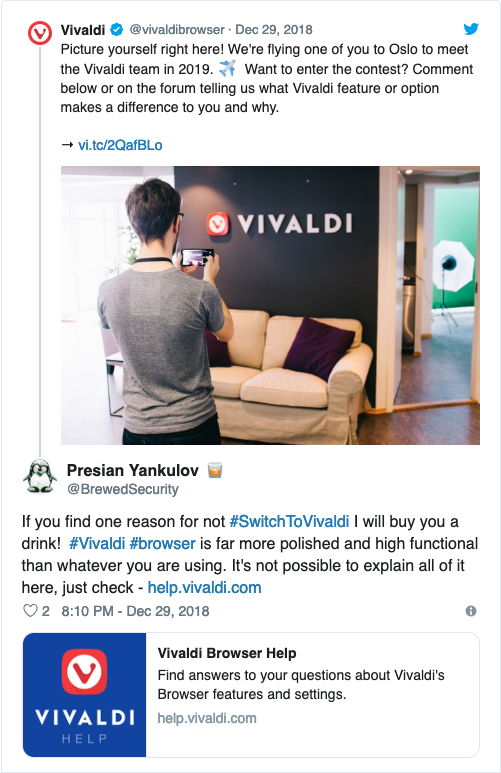 I have been following Vivaldi development since last Christmas when my uncle introduced me to it. I had held off until recently as I was waiting for an Android version, but with the new Chrome changing the settings and logging you into the browser when you sign into any page I decided to switch my personal computer over to evaluate it for myself and my classroom (I’m a technology/engineering/computers science/CAD/rapid prototyping/etc. teacher). I really love Tab stacks and having screenshots of my tabs on my sidebar. It makes my workflow much smoother. I also really love tiling tabs, especially when comparing features when shopping or figuring out code that inherits from parent objects. I can’t wait to get my classroom lab using Vivaldi and show my students the clever features I’ve come to rely on. What makes a difference for me? Generally speaking the multitude of features that are given “out of the box”. 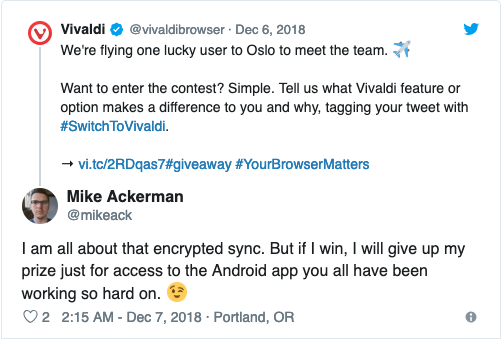 Vivaldi welcomes user with something surprising in these times (sic!) – a user interface which hasn’t been dumbed down! It makes me feel that I am not treated as a complete id… beginner. Which feature makes the biggest difference to me? Synchronizable notes 🙂 I am addicted to creating notes whenever I am doing something on the computer. And (finally!) I can share all of them between all of my systems 😃 This is a total game changer for me. The ability to take notes is really handy…. Especially when you don’t have too much ram to spare in order to open the Office program or let’s say OneNote. Also… Please bring that Android browser… I don’t care if it’s Beta or even Alpha. I like Vivaldi for the direct shortcuts without a specific Key like Ctrl or Cmd. This is the fastest way to switch to tabs, etc. I even did set up „E“ as a shortcut to the Quick Commands. Thank you to all at Vivaldi for your fantastic work making it the delight that it is to use! While there are hundreds of benefits, the biggest for me is the keyboard shortcuts and the way they integrate so well. I choose to work with multiple keyboards and create custom dedicated keyboards for each programme I work with (using AutoHotKey and Intercept, for anyone who’s interested). Because Vivaldi has the choice to change keyboard shortcuts, this works much better for additional keyboards and saves me hours of testing and changing compared with other programmes when they update their software. For someone who is a fanatic of productivity, this makes my life significantly easier – thank you, Vivaldi! For a user that lives in a third world country and has a 10+-year-old PC I love the fact that Vivaldi browser is lightning fast compared to the other main browsers in the industry, add the high level of customization and privacy settings the browser has by default and it’s a pure win-win situation. For me there is not a single big reason to use Vivaldi, there are many small things that add up. Sometimes I have two PDF documents I have to look at at the same time, so being able to split the window and show two websites is amazing. I also always have a lot of tabs open (114 atm – looked it up using the “window” pane), I always keep them thinking I might need them at some point, which I usually don’t, but if I do, I just press F2 and search them. One feature I use a lot too is Gestures, mostly to go back or close a tab – it’s way faster. There are a lot more things, most of which I probably don’t even think about and I can be sure that the dev team will keep on adding new ones and improving upon existing ones. I thought a lot about what feature I like best, and I can reflect on my choices on those that I showed for my dad, and my girlfriend. For my dad, who is an elderly person, the speed dial thumbnail size is perfect for him, he has sight limitations, and the themed colored tabs also help him to show what page he is on. The status bar with the easy zoom option is what he liked best. For my girlfriend, definitely the Web Panel, she is doing her masters on linguistics so having that feature makes her very productive in research. 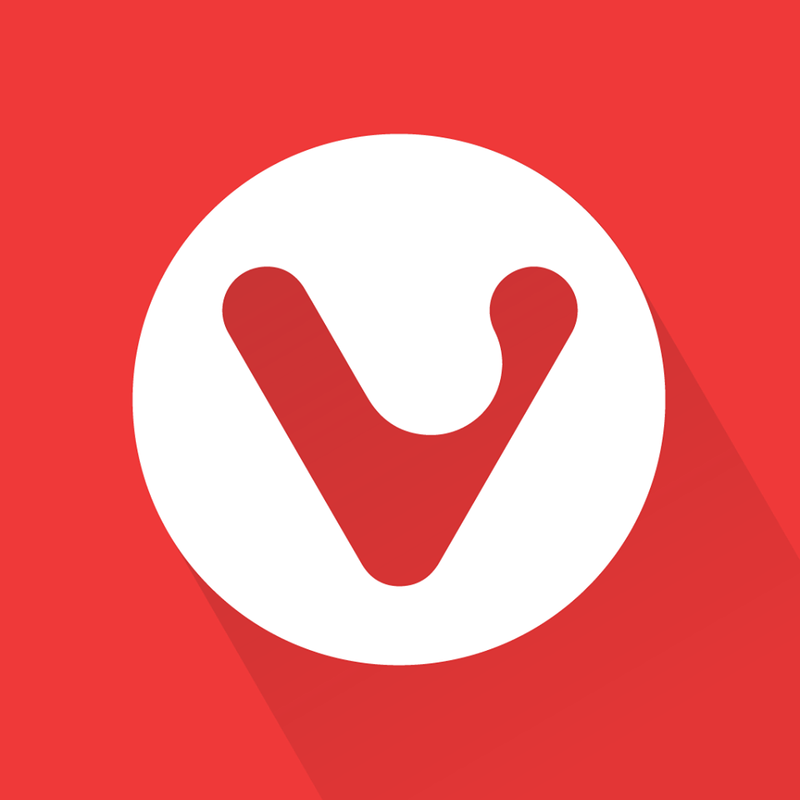 Vivaldi has become default browser now for my parents, my girlfriend, and of course me. 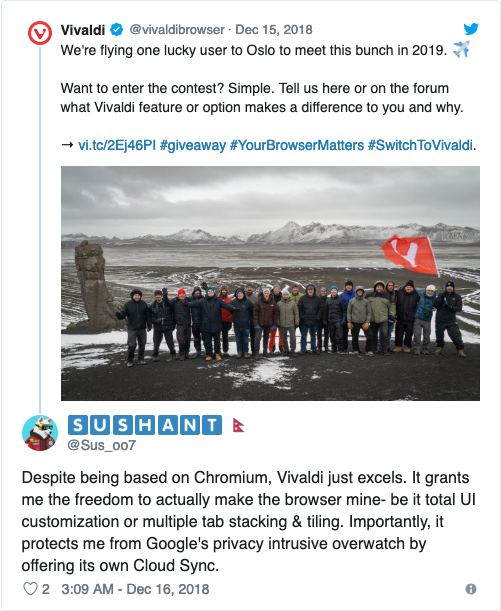 Not a feature, but the most important part of Vivaldi for me is that it’s a Chromium browser that doesn’t steal your data. I really appreciate it and is the reason why I made the switch. However for a feature, I also found myself quite fond of tab stacks, they’re really handy! The best feature of Vivaldi is the beautiful appearance and above all, the fact that the ‘front end’ does not dictate what news or features you see – Vivaldi is all about your taste and not someone else’s curated guess! You can do that with Vivaldi too? !